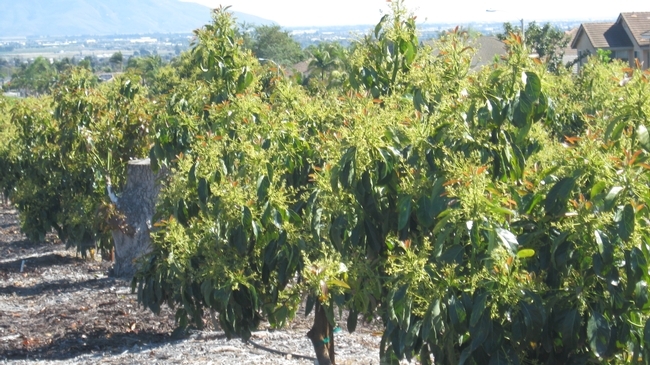 Some call it tip burn which is often what you see on an avocado as it goes into flowering. The areas where avocado are grown typically have a lot of salts in the water, but also specific salts like sodium and chloride. Over the irrigation season (which is all year long there is little or no rain), the salts in the water/soil are taken up by the tree. In adequate rainfall years, there is enough water to leach those accumulated salts from the root system. 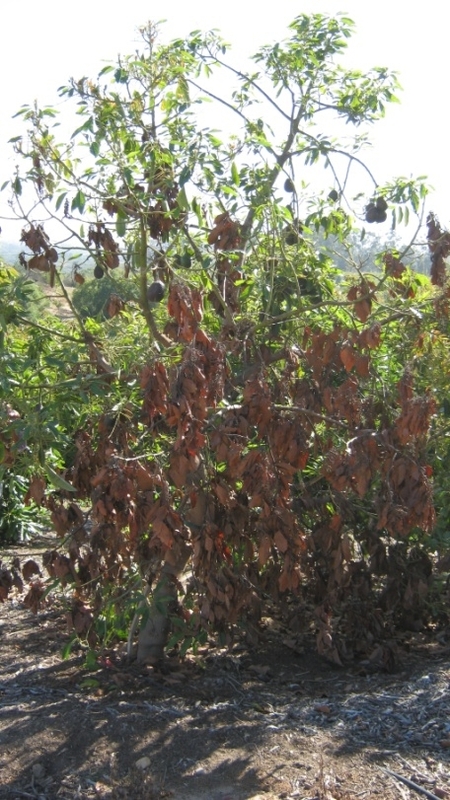 When we go for several years with low rainfall and we keep irrigating with the poor quality irrigation water, the trees develop die back at the tips and is conditions worsen more and more of the leaf is called. This can get to the point where you can not call it die back any longer. It's called leaf drop. I've recently seen a number of orchards that are completely defoliated. No leaves. We have had a number of homeowner calls asking what the problem is and what they can do about it. The damage is done and those leaves are not coming back. 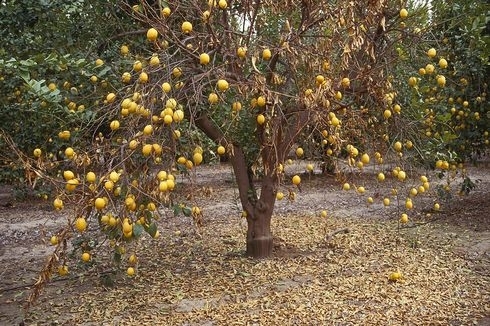 It's possible to reduce the damage if one acts early on by applying more water than is usually applied to aid the leaching process, but if it is poor quality water, there will still be damage, but possibly not defoliation. With high priced water or where water is being rationed, many growers and homeowners do not have themake the option of putting on the excess water. There is no chemical or equipment that is going to make the situation better. When you trees defoliating, you want to cut out those that are diseased or you know have been poor producers and put what water you have on the remaining trees in better condition. 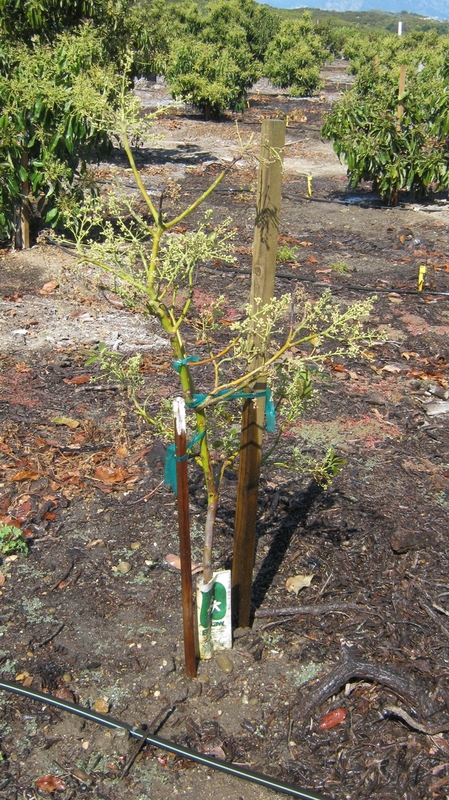 This advice is good for other evergreen tree crops like citrus, although they are not as sensitive as avocado. Avocado is an indication of how bad it really is. In both avocado and citrus there can be a rapid collapse of tissue brought on by a host of related fungi. The pathogen was once lumped as Dothiorella, but lately University of California extension plant pathologist Akif Eskalen has been able to tweeze out more species which mainly belong to the Botryosphaeria genus. The collapse can be quite rapid, so fast that the leaves continue to hang on to the tree. 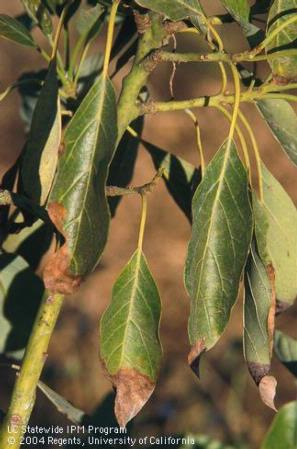 This disease is more common in years of low rainfall, where inadequate water is being applied (especially when Santa Ana winds are blowing), and where salinity build up has occurred. In the last 2 months, I have been called out to diagnose this problem five times. In each case, they were trees that had been sidelined and neglected or the grower was trying to save money by saving water. Luckily for a mature tree, there can be recovery as long the tree is protected from sunburn that occurs with defoliation. White wash the exposed parts, and wait for recovery. When it is clear what part is recovering, cut into fresh wood to remove the dead parts. For a more detailed discussion of this blight, see our 2009 Topics in Subtropics.